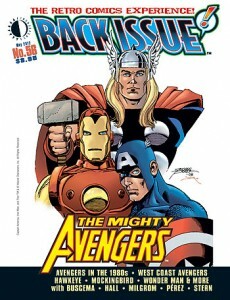 Back Issue #56 and Alter Ego #108 FINALLY here! For all you who’ve been patiently waiting for your April issue of Back Issue and Alter Ego, copies FINALLY arrived here at TwoMorrows HQ today, and will go in the mail tomorrow. The hold-up was caused by US Customs. Now that both mags are full-color, we have to print them overseas to keep the cover price from skyrocketing, and all the copies got held up at the US port, waiting for, I guess, some SHIELD agents to inspect them. After weeks of sitting in a warehouse, they were finally released and delivered, and subscribers’ links to the digital edition were emailed today. 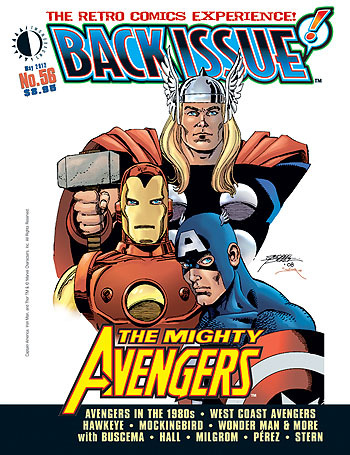 Back Issue #56 spotlights the history of the Avengers, just in time for this weekend’s movie debut, so check it out before you head to the cineplex. This entry was posted in TNT on 2 May 2012 by Mr. Morrow.